Welcome to the Northwest Chorale 2018-2019 Season! Plus there is an early giving period April 23 - May 7. Check out these Donor FAQs about the campaign and Northwest Chorale's fundrasing ... and get ready to Give Big! A huge thank you to everyone who attends our events. We apprciate your support of Northwest Harvest, choral music in the greater Seattle area and the Northwest Chorale. Our 2nd annual MOD Pizza fund raiser on Pi Day Eve, March 13, 2019 was a huge hit! Thanks to MOD Pizza and to everyone who came in for a piece of the pie! Link a Fred Meyer rewards card to Northwest Chorale, and every purchase results in a donation! Find out how! 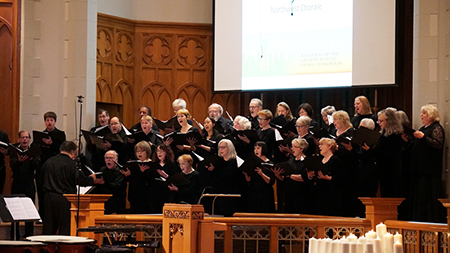 The Northwest Chorale is a member of the Greater Seattle Choral Consortium (GSCC), a group of over 80 choirs throughout the greater Seattle area. We encourage you to visit the consortium website for more information on member choruses and upcoming concerts.